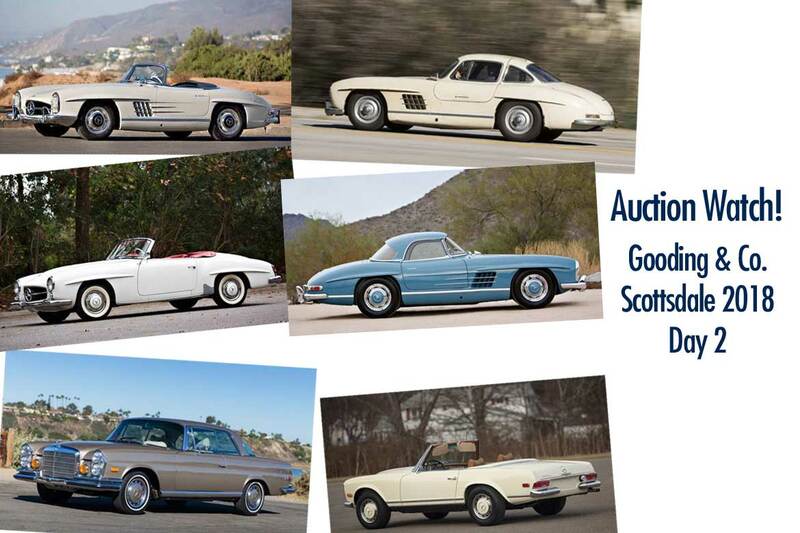 Gooding and Company will be offering a total of 131 automobile lots, over two days, at their upcoming auction in Scottsdale, Arizona – January 19th and 20th. There are 13 Mercedes-Benz that will appear at the Gooding and Co. sale, 7 on Friday and 6 on Saturday. This article is a preview of the 6 Mercedes-Benz cars being auctioned on the second day of the sale. Click here to visit my write up of the cars being offered on day 1, Friday, January 19th. 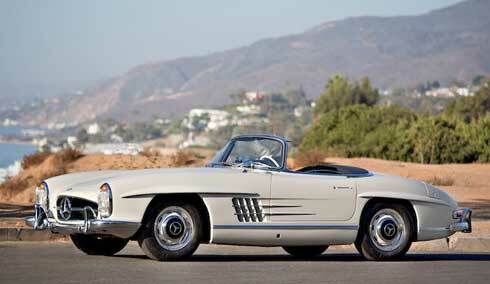 No less than five 300 SLs will be offered over the two days of the Gooding sale. 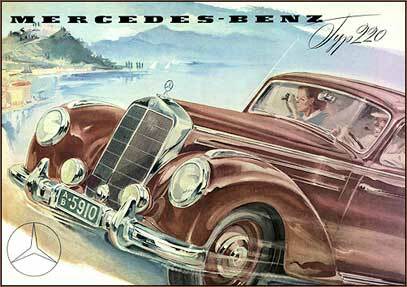 I take this as a sign that 300 SL owners have accepted the mild pull-back on 300 SL prices since the high tide of 2014 and 2015 and are ready to sell their cars in the ‘new normal’ range of $1 – $1.5 Million. Last year, during Arizona’s auction week, there were just three 300 SLs offered during Arizona auction week last year, and that’s across all the auction companies, two at Gooding and Co., one at RM… none at Barrett-Jackson or any other auction company. In addition to these 300 SLs Gooding will be offering two 190 SLs, three Pagoda SLs, a 280 SE convertible, a 280 SE 3.5 coupe as well as a handsome 300 SEL 6.3. It’s the kind of assortment we’ve come to expect from a Gooding and Co. sale. Some perfect show cars, good original cars and nicely restored drivers. The Mercedes offerings from the second day of the Gooding and Co. sale are laid out below with my commentary on each car in italics. Full details about the auction location, date, time and admission information is included at the very bottom. I’ve done something new here, which I might regret, but it’s what I do while sitting at the auction with friends… guess what the cars will actually sell for. My guesses are at the end of each car’s commentary. 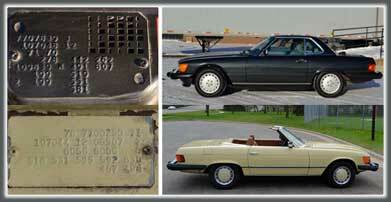 Based on the catalog description, nothing just leaps out to me as ‘special’ about this 280 SL. It is said to be mostly original save for a repaint in its original color and a new soft top. On the plus side, it does seem to have good documentation and paperwork, the original window sticker, etc. The manual transmission is a check in the ‘positive’ column. While Pagodas look good in Ivory (is there a color they look BAD in?) it isn’t a very special color. In today’s market this car should sell in the $80,000 range. I was lucky enough to be invited to stay at Neil DeAtley’s house in Scottsdale during auction week in 2014. Neil’s place in Scottsdale housed close to 100 cars in a series of garages and above one set of garages he built fully furnished multi bedroom apartments for guests. I took this photo during my stay at DeAtley’s, it only captures a portion of Neil’s ‘Mercedes Room.’ The 300 SL being offered by Gooding and Co. is front right. It was quite a place and a real honor to spend the night above some really great cars. Neil’s ‘Mercedes Room’ was full of great examples of just about every Mercedes-Benz you’d ever be interested in owning… SLs, coupes, sedans, all the greats. There was a Cadillac room, a Packard room and other rooms with a huge variety of collector cars. From a 300 SL Gullwing and Roadster (the car Gooding and Co. is offering) to a 1980s vintage Cadillac Seville diesel to a Morgan Plus 8, to Pre-War Packards… there was something for everyone in Neil’s collection. He was a gracious guy who invited car clubs and enthusiasts into his collection regularly and he will be greatly missed by the collector car community. The DeAtley provenance alone makes this car special in my eyes, although he only acquired it in 1997, you can be sure it had the best possible care during his ownership. I understand that a well known east-coast based collector car dealer bought a number of the Mercedes from the DeAtley estate recently and this is one of them. 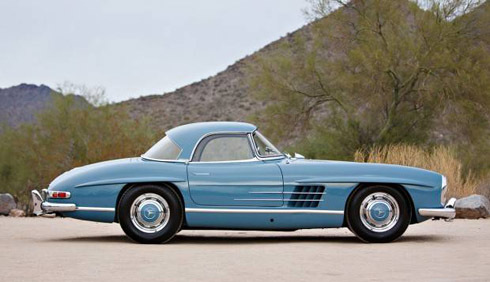 This is a fairly unique color for a 300 SL, ownership history is known and fairly limited. I think the market will reward such a nice car from a good home with bidding to exceed Gooding and Co.’s high estimate of $1,200,000. It wouldn’t surprise me if it did $1,400,000. The auction catalog doesn’t mention any history prior to 1975. First restored in the mid 1980s by Gullwing Service Company (later called Paul Russell and Company) in Massachusetts, this car was color changed at some point. The consignor had the car repainted in its correct color of White Gray (Weissgrau DB 158) and installed a black leather interior and soft top as per the original factory specs for this car. It is presented with a black hard top and hub caps, you may want to check those against the build card if correctness is important to you, but this two tone combination is quite elegant. 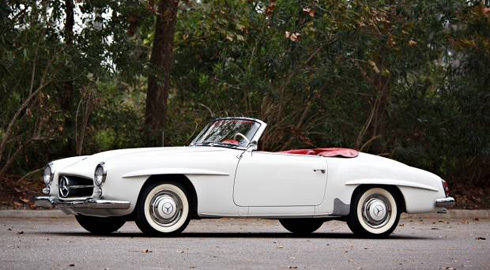 So many collectors believe the late roadsters are ‘the ones to own, so then usually demand a premium. Without perfect provenance back to day one however, I don’t think this one has a chance to meet its low reserve. I think $1,400,000 is all the money here. 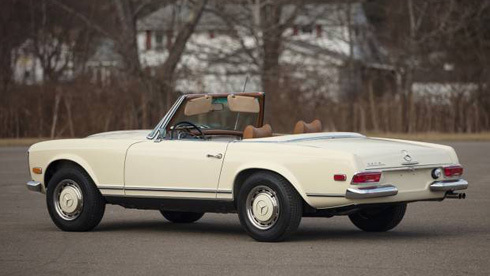 This car is described in the auction catalog as an “older restoration having mellowed and displaying a gentle patina.” The 190 SL market was a lot different in the 1990s than it is today. The 190 SL market was still quiet at the beginning of the millennium, but then, prices skyrocketed between 2012 and 2014. By 2015 the market was saturated with every manner of 190 SL anyone could push, pull or drag to their local restoration shop for a quickie re-do. There are usually 60+ 190 SLs advertised on Hemmings at any given moment these days. That market saturation has taken a toll on values. Still, restoration costs are enormous. It costs the same amount to rechrome a 190 SL bumper during restoration as it does a 300 SL bumper, so there is value in buying someone else’s restoration, even if the work was done 20 years ago. I find the later 190 SLs fitted with the ‘big window hard top’ more attractive than the early cars. It’s tough to get 6 figures for an older 190 SL that’s showing ‘gentle patina.’ I think this one will struggle to bring $90,000. 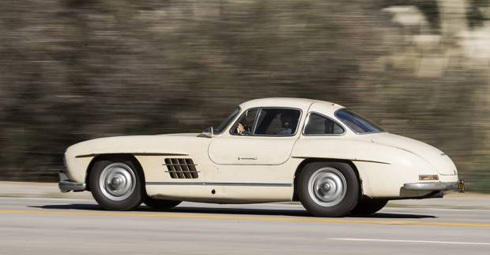 This is my favorite 300 SL of the sale, and I can’t wait to see it. Have a look at the photos of this car on Gooding and Company’s website, it doesn’t get any more ‘pure 300 SL’ than this. It’s an early car with Rudge wheels, it’s kind of beat up, paint is chipped, interior is worn out, it’s perfect! Perfect because it has been mechanically freshened, but has been left alone in terms of cosmetics. 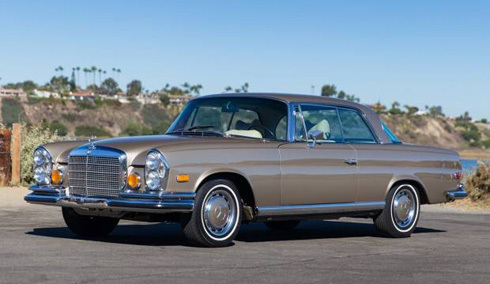 While the auction catalog states that the recommissioning of the car was done 10 years ago after sitting since the early 1990s, the work was done by Steve Marx of Costa Mesa, CA, a well respected Mercedes specialist. I dare say you could take the car back to him for additional sorting and tuning and have a unique looking event car in fairly short order. This car was originally equipped with red plaid and tan vinyl interior, so at some point that was replaced with the brown leather it’s got now. The current interior is in need of replacement anyway, so I would hope the new owner would stay true to the build card and install a plaid / vinyl interior. This is exactly the kind of 300 SL I’d like to own, sort of beat up with plenty of character on the outside, but in good enough mechanical condition so it can be taken on tours and driven regularly. I like that it’s not a total wreck of a barn find and I hope whoever buys it keeps it as it is in terms of its cosmetics. The market seems to pay up for pure barn finds and perfect restorations by top experts… this car lands somewhere in the middle. I would HOPE this charming, early 300 SL surprises on the auction block and does $1,300,000+ but $1,150,000 is probably more realistic. The W111 coupes have to be one of the best 2 door designs to ever come out of Mercedes-Benz and the 3.5 V8s are the most desirable of the lot. The W111 3.5s have even surpassed comparable Type 128 series coupes, the 220 S and 220 SE built between 1956 and 1960. The Ed Sullivan provenance can’t hurt, as I imagine most potential buyers of a coupe like this have fond memories of watching Ed Sullivan on Sunday evenings when they were kids, maybe good for 10% on this car. In my experience, Tunis Beige is a polarizing color, people either love it or hate it, some people just can’t stand ‘gold cars’. The estimate for this car is right in the range where it should sell, the devil will be in the details. If the engine bay is as nice as the new paint and interior I think it will reach $145,000. Day 2 at the Gooding sale has some great cars and the 6 Mercedes above are worth a look. I will look forward to attending day 2 and watching the market speak its mind about this selection. If you’re headed to Scottsdale in a couple of weeks, everything you need to know about attending this auction is below.